See the Black Warrior and Tombigbee Lakes website for additional information. Primary recreational opportunities are listed below. Directions: Bankhead, Holt and Oliver Lakes: From Tuscaloosa, 10 mi E on AL 216 to Peterson Asst. Resource Manager's Office. Warrior, Demopolis and Coffeeville Lakes: From Demopolis, US 80 W 2 mi to Lock & Dam road to the Resource Manager's Office. Factoid: The Black Warrior & Tombigbee Lakes (BW&T) consist of six lakes (Demopolis, Coffeeville, Warrior, Oliver, Holt and Bankhead) with a combined total length of 457 miles and 39,800 surface acres of water. There are boat launching ramps at nearly all the Corps public recreation areas. There are three privately owned marinas that provide fuel, boat repair, supplies, rentals and meet other boater needs. 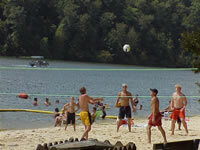 Boaters from across the State and the country come here for their boating pleasures. Whether water-skiing, sightseeing, sailing, powerboating or jet skiing, these waters are for everyone!